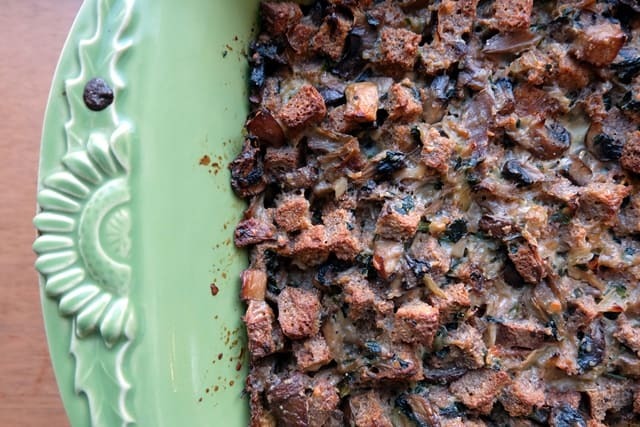 I’d like to introduce you to this gorgeously moreish mushroom bread pudding recipe. 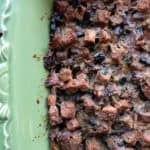 It combines mushrooms – luxuriously delicious and earthy in their own right – with a velvety and creamy bread pudding base. The perfect comfort food, it’s also a great way to reduce wastage of leftover or stale bread. This savoury bread pudding recipe makes a scrumptious side dish (serve with roast chicken for example) but also works perfectly well as a mid-week lunch or dinner, ideally with a sharp salad on the side. Choose your mushrooms well! They will lend the bread pudding their distinctive flavour. Go for white or brown button mushrooms if you can’t get your hands on other varieties with a more unique taste, but if available, try to at least mix in some porcini or shiitake mushrooms. Go and harvest your own wild mushrooms if you can and make them the main event of the bread pudding! 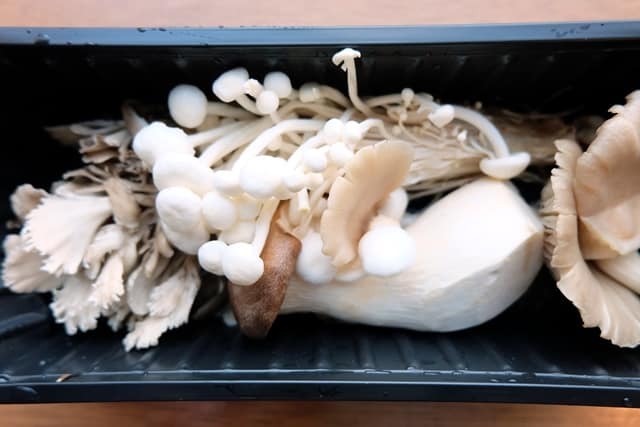 Mushrooms have also received a lot of press coverage of late for their health properties and if you’d like to read more about this, take a look at this article for a short overview or watch this video for a fascinating interview with mycologist Joe Rogan. Lots of bread puddings use brioche or challah as the bread base. However, for this savoury mushroom bread pudding, I prefer the earthy flavours of sourdough bread containing rye flour e.g. pain de champagne. You can use cheddar cheese as your base cheese, but I like to at least mix in some other flavours e.g. Gruyère or Parmesan. Your cheese choice (same as your mushroom and bread choices) will have a big impact on the bread pudding’s flavour. 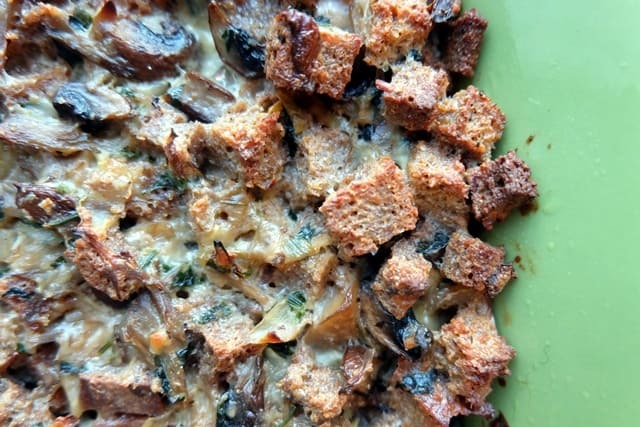 Combine the best and most flavoursome ingredients you can find and bake this mushroom bread pudding recipe to perfection - with a crisp surface and melting interior. Choose a deeper casserole dish for a more tender pudding, a shallower dish if you like to have more of the crusty top layer. Toast bread cubes in in a large shallow baking pan until golden-brown, about 10 minutes. Heat the butter in a medium-large frying pan. Add the chopped onion and fry over a medium heat, stirring occasionally, until it begins to soften. Add the chopped mushrooms, minced garlic, 1/2 teaspoon salt and 1/4 teaspoon freshly milled pepper. Continue to fry and stir until the liquid the mushrooms give off has evaporated (about 15 minutes). Add the white wine and parsley and continue to fry and stir for another few minutes. Check the seasoning and remove from the heat. In a medium-large bowl, combine the milk, creme fraiche, single cream, eggs and grated Parmesan cheese, 1/2 teaspoon salt and 1/4 teaspoon freshly milled pepper. Stir in the toasted bread cubes and the mushroom mixture until coated well and let stand for 10 minutes to allow the bread to absorb some of the cream and egg mixture. Butter the baking dish. I used a square dish (20 x 20 cm), about 8 cm deep. Spoon the mixture into the baking dish and place on a rack in the lower third of the oven. Bake for 30 to 35 minutes until nicely browned on top. Please note that the baking time will depend on the depth of the baking dish you have chosen.